The Air Force One carrying President Barack Obama landed at the Royal Malaysian Air Force (RMAF) base here at about 4.50pm from South Korea. 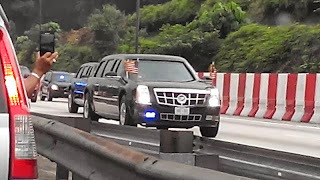 Wearing a dark suit, the US president arrived to be welcomed by Malaysian government officials, Foreign Minister Datuk Seri Anifah Aman, Youth and Sports Minister Khairy Jamaluddin, Malaysian Ambassador to the US, Datuk Dr Awang Adek Hussin and Special Envoy to the US Datuk Seri Dr Jamaluddin Jarjis. 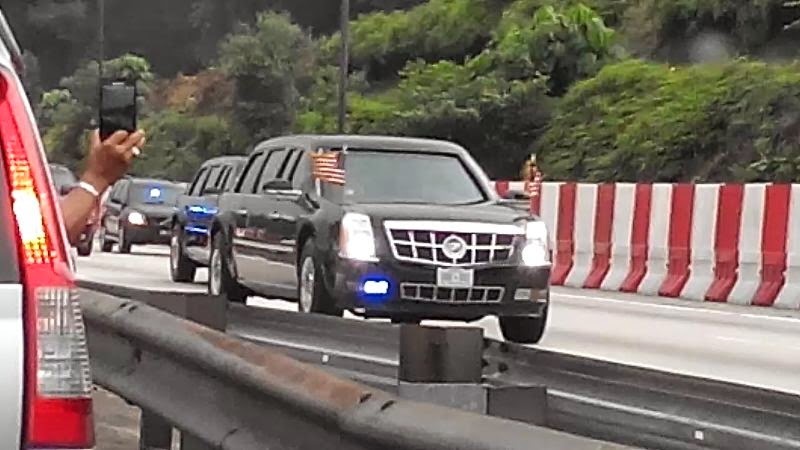 President Obama left the airbase in his presidential limousine "The Beast" for the Parliament Building in Kuala Lumpur to start his tour in Malaysia. President Obama is the first US president to visit Malaysia since Lyndon Johnson in 1966 as he tours Asia to strengthen ties. President Obama met up with the Yang Di Pertuan Agong in the evening and attended a state dinner. On Sunday, he will visit the National Mosque in Kuala Lumpur and have a meeting with Dato Seri Najib, before a "town hall" meeting with youth leaders from around Southeast Asia. He will leave Monday morning for a visit to the Philippines.